Long-term investors might want to consider these two potential diamonds in a rough corner of the market. Most of the major automakers have had a very rough year in the stock market. That's no surprise, under the circumstances. Autos are cyclical stocks, meaning that their profits tend to rise sharply early in an economic expansion, stall as the expansion matures, and then fall as the economy slows. While we're not (yet) in a recession, there's a sense that automakers' profits have peaked, and that has pushed their stocks out of favor. Of course, there are usually opportunities for investors when an entire industry goes out of favor. But which auto stocks are the ones to buy right now? 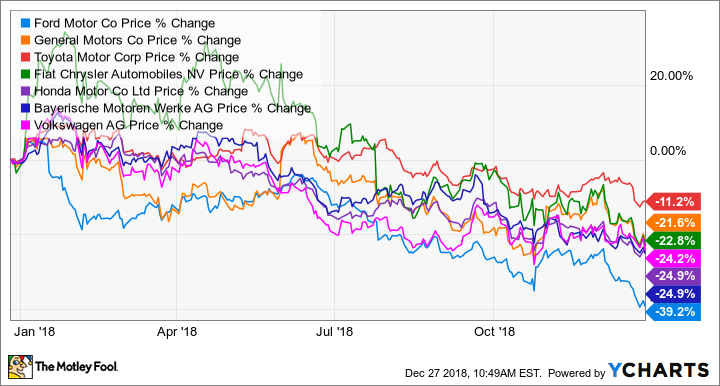 There's room for debate, but right now I think Ford Motor Company (NYSE:F) and Ferrari (NYSE:RACE) are -- for very different reasons -- the two auto stocks that most deserve a closer look. Most automakers have had a tough 2018 -- but as you can see from the chart above, Ford's stock has fallen further than most of its rivals'. In fact, as I write this, it's trading at levels we haven't seen since late in 2009 -- the early stages of the last economic recovery. Sales of Ford's super-profitable F-Series pickups have remained strong. But other parts of Ford need work that will take a few years to complete. Image source: Ford Motor Company. There are some legitimate reasons for investors to be worried about Ford. Ford's sales in China -- a growth story just a few years ago -- have fallen 34% this year through November. Simply put, Ford appears to have overinvested in production capacity in China, while underinvesting in new models. New leadership is addressing both issues, but a turnaround will take time. Ford is doing somewhat better in Europe: Its small cars, the Focus and Fiesta, are selling well -- but profits have been scarce, as new models haven't delivered the pricing improvements the company expected. Executives say a significant overhaul is needed, including new models (more SUVs). Ford is still doing well in North America, thanks to still-strong sales of its hugely popular (and hugely profitable) F-Series pickups. But when rival General Motors (NYSE:GM) said last month that it will cut 14,000 workers and close seven North American factories, it raised the possibility that Ford might soon make cuts as well. Given all of the above, Ford executives have been blunt: Profit growth isn't likely in the near term. It'll take until 2020, at least, until meaningful improvements begin to show up on the bottom line. So why buy Ford, given all of the above? Here's why: Ford pays a dividend of $0.15 per share every quarter, and it's determined to keep paying that dividend even if the economy goes into recession and profits are squeezed. That's not idle talk: CFO Bob Shanks has explained at length how Ford's hefty cash hoard and the cash flow from its captive-financing arm should be more than ample to continue dividend payments through a recession. While all bets are off if the recession is unusually severe or protracted, of course, Ford's plan is realistic and credible. At current prices, Ford's dividend is good for a yield of about 7.2%. 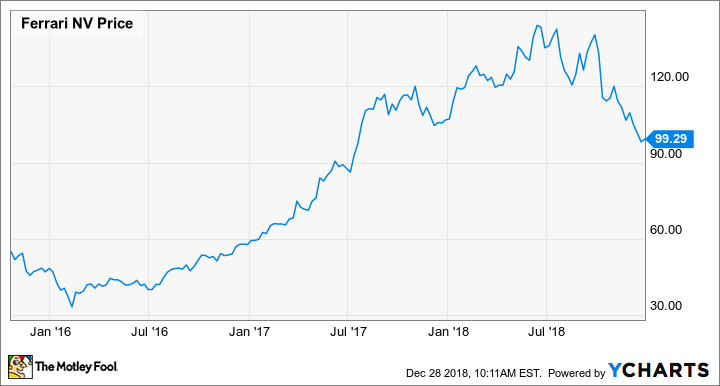 If you buy now and stay patient, reinvesting the dividend through whatever restructuring pain and economic storms lie ahead, you might be very happy with the results when Ford's profits start growing again. While Ford is in some senses a turnaround story, Ferrari is anything but: The storied maker of exotic sports cars has posted eye-popping margins in recent quarters, as demand for its creations has continued to outpace its carefully managed supply -- despite some ambitious price increases. The price increases are part of a larger plan: CEO Louis Camilleri expects Ferrari's adjusted earnings before interest, tax, depreciation, and amortization (adjusted EBITDA) to nearly double by 2022, rising to between 1.8 billion euros and 2 billion euros (between $2.1 billion and $2.3 billion) from 1 billion euros in 2017. The Ferrari Portofino convertible was designed specifically to bring new buyers to the brand. Sales have been strong since its debut early in 2018. Image source: Ferrari. In a nutshell, the plan to get there involves a series of new models, including some tailored specifically to Chinese customers, a new thing for Ferrari. There's also a new line of ultra-high-priced (think seven figures) limited-edition models for the wealthy enthusiasts who make up Ferrari's core client base. The plan walks a fine line between increasing sales and preserving Ferrari's exclusivity, and I think it stands a very good chance of success -- if (and this is a big if) the global economy cooperates. While Ferrari is probably less vulnerable to an economic downturn than mass-market automakers, a recession could cause the company to miss (or at least delay) its ambitious profit-growth targets. High margins plus likely profit growth sounds like a great combination, doesn't it? There's a catch, of course: Like everything else having to do with Ferrari, the stock isn't cheap. Ferrari has argued (persuasively) that its luxury-level margins deserve a valuation more like a luxury-goods maker than a traditional automaker, and it has one: It's currently trading at about 27 times its expected 2018 earnings. I didn't include Ferrari in the industrywide chart above. But here's a look at how it has performed since its October 2015 initial public offering. As you can see, it's arguably on sale right now. RACE data by YCharts. The chart shows the closing price of Ferrari's stock from its initial public offering through market close on Dec. 27, 2018. Ferrari will probably never again be as cheap as it was in the first few months after its IPO. But given its outstanding brand, pricing power, and legitimate profit-growth prospects, it could be a terrific buy for a long-term investor at current bear-market prices.